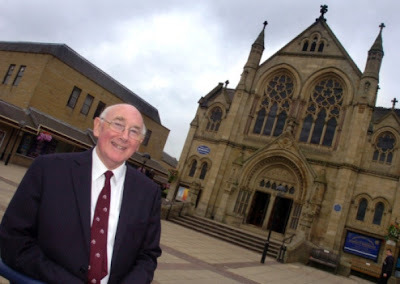 A MINISTER who was a founding member of his church has retired from his post in Dewsbury. The Rev John Jenkinson was the first minister at the country's first United Reformed Church in Altrincham, near Manchester. On Sunday - his 65th birthday - he led his last ever service at Longcauseway United Reformed Church in Dewsbury. Mr Jenkinson worked in Altrincham after training as a minister in Manchester. He later worked in Halifax, then as a chaplain in Bradford's hospitals before coming to Dewsbury in 1996. "I didn't know Dewsbury before I came, but I knew about the markets," he said. "I felt at home almost from the beginning. I have a real fondness for Dewsbury and its people." One of Mr Jenkinson's proudest achievements has been the opening of a vestibule ministry four days a week in an extended Longcauseway URC. He was a founding member of Churches Together in Dewsbury and a key figure in the Spen and Calder Enterprise (SPACE) group of churches. He has led services at Heckmondwike, Norristhorpe, Gomersal, Earlsheaton, Ravensthorpe and Hopton URCs. As this will be my last letter, I am going to do what I originally decided not to do; that is reflect on my 40 years of ministry, both highs and lows. I’m one of a dwindling band of clergy who can go back as long as this. Most newly ordained Minister’s will have spent considerable years working in other professions. In doing so, they bring considerable experience and expertise of life outside of ministry as well as a knowledge of how lay-folk earn their living. I was grateful for the experience of work prior to entering College in Manchester at 21. I left school at 14, with few formal qualifications and had to work hard to get the required O levels for College entrance. I spent some time in the Merchant Navy training as a Steward; where I felt God’s presence in an incredible way. I returned home and studied to be a Supermarket Manager, which helped to build up my confidence dealing with people. During this time, I felt the call of God even more strongly, and thought about Mission work. When I shared this with my Minister, he was completely taken by surprise. I was the introvert, my twin brother was the extravert; so I can understand his reservations. I did also query whether I could be a Minister and not preach; as I was nervous and tongue tied in public. His reply was short and to the point – ‘It goes with the job, John’. I also worried about how I would manage financially as the local LEA would not give grants to those studying Theology. He reassured me that God would provide – and he did. So much so, that after three years training; I was offered a grant for my final year, and was actually worse off. My ministries have included single pastorates, but because of the shortage of minister’s they have ended up as joint or group pastorates. I have always enjoyed working in team ministries, including full time Hospital Chaplaincy , and greatly valued and been enriched by working alongside a broad spectrum of ministers. The danger of such ministries is that we can spread our Ministers too thinly; and place heavy burdens on them during vacancies. I have to confess that I am not a fan of floating ministry – it takes too long to get to know folk and build up trust. People who know me will agree that I am not an administrator and unashamedly, my skills are pastoral in nature. Fortunately, I have been blessed throughout my ministry with secretaries who have been very patient with me, and given freely tremendous gifts of support and expertise. I was fortunate to have witnessed at first hand, two Ministers in particular, who were faithful and loving pastors of their people, who had a simple but effective way of ministry. They simply loved them, even the unlovable – and that takes a great deal of patience and skill. I have tried to emulate them if only in a small way. I am always suspicious of Christians who are always cheerful and enthusiastic and never seem to have a low day. Some people are very clever at disguising their inner pain and retain a smile even though their heart is breaking. Many Christians do no desolation. They have seen long held hopes come to nothing. Either their own marriage perhaps, or that of a near relative or friend has entered a bleak period to which there seemed no end. A church’s vision for the future has lacked the people or the money to put it into effect. Some have seen loved ones going to war in places like Iraq or Afghanistan and have had to learn how to live in the ‘Interim’. A drug addiction or depression of a son or daughter has created a Good Friday for which there seemed to be no Easter Day. The disciples on the Emmaus road were in this 'interim period’; their lives were in turmoil- especially as they had heard rumours of Jesus appearing to some after being dead and buried. How do we survive when our lives are shattered by loss? Jesus needed makrothumia to live creatively when few understood his message. Amos needed makrothumia to continue to preach in a God rejecting society, Jeremiah when he was thrown down a pit to silence him. Nelson Mandela showed it during his years in prison. We can better develop this virtue when we realise that makrothumia is an attribute of God. Peter (1 Peter 3.20) attributes it to God in waiting. God has patience with his people. Jesus told his disciples before his Ascension to go to Jerusalem and wait there. It is the gift of God to us, as it was to the disciples to simply wait upon God in Christ in all circumstances - the gift of steadfast waiting.